Westport Community Theatre is currently producing the comedy Picasso at the Lapin Agile by Steve Martin. Performances take place from April 5th through April 21st, on Fridays and Saturdays at 8:00 p.m. and at 2:00 p.m. on Sundays, with a Thursday performance on April 11th at 8:00 p.m. Mat Young directs the play, which is produced by Sam Mink. The long running Off Broadway comedy was the winner of the 1996 Outer Critics Award for Best Off Broadway Play. It places Albert Einstein and Pablo Picasso in a Parisian cafe in 1904, just before the renowned scientist transformed physics with his theory of relativity and the celebrated painter set the art world afire with cubism. In his first comedy for the stage, Steve Martin plays fast and loose with fact, fame, and fortune as these two geniuses muse on the century’s achievements and prospects, as well as other fanciful topics, with infectious dizziness. The New York Times had this to say about the comedy: "It’s important to remember that the playwright of Picasso at the Lapin Agile is Steve Martin, stand-up comic, actor, writer, banjo player and something of a genius in his own right. So when big questions are being addressed, you can be sure that a layer of silliness is always in place (and, subversively, a layer of seriousness beneath that)." The Hartford Courant called Picasso at the Lapin Agile, “Equally smart and silly” and the New York Daily News called it "Consistently entertaining." The Westport production’s director Mat Young is a graduate of The New Actor’s Workshopand has also directed Arcadia with WCT. Last year he directed The Boys Next Door at Curtain Call Theatre and other directing credits include: Young Frankenstein and Dancing at Lughnasa at the Wilton Playshop, A Midsummer Night’s Dream withLawnChair Theatre, Last Days of Judas Iscariot at Vagabond Theatre Company and Hamlet at the Bijou Theatre. Cast in the WCT production are Kathryn Alane, Ari Benomosche, Betzabeth Castro, Patrick Duffy, Jessica Grabarz, John R. Smith, Jr., Amy Kozumplik Kirby, Andrew Kirby, Sophie Tiesler and Emily Vrissis. 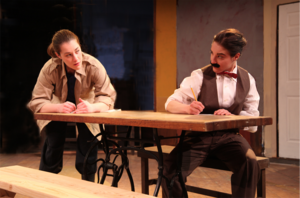 Grabarz, who plays Einstein in the production, is a newly graduated actress from Housatonic Community College in Bridgeport. She is returning to the WCT stage from The Diary of Anne Frank, as Miep Gies and past roles also include Prelude to a Kiss. Vrissis is making her debut as Picasso at the Westport Community Theater. Her recent regional credits include: Romeo and Juliet at Westport Country Playhouse and Crazy For You at Heritage Theater Festival). She has also been on stage as Gwendolyn Fairfax in The Importance of Being Earnest, Laertes in Hamlet; Mush in Newsies and Dance Captain in Ragtime. Picasso at the Lapin Agile is produced by arrangement with Samuel French, Inc. Tickets are $25 ($23 for seniors and $15 for students) and can be purchased at westportcommunitytheatre.com or by calling (203) 226-1983. Westport Community Theatre is located at the Westport Town Hall, 110 Myrtle Avenue.